Home»Just Hungry reference handbooks»Cooking courses on JustHungry.com»Courses for 2013»Japanese Cooking 101: The Fundamentals of Washoku »Japanese Cooking 101: Lesson 5 theme and ingredients revised to - Fish! I have been re-thinking the last cooking lesson for Japanese Cooking 101. Originally I was going to do a mixed fish and meat lesson, but I think I will concentrate on fish since I really haven't covered fish cooking much over the years on Just Hungry. The problem I've always run into is that the availability of fish is very spotty around the world, so I'm never sure if the readers of the site can get their hands on the fish I'm talking about. 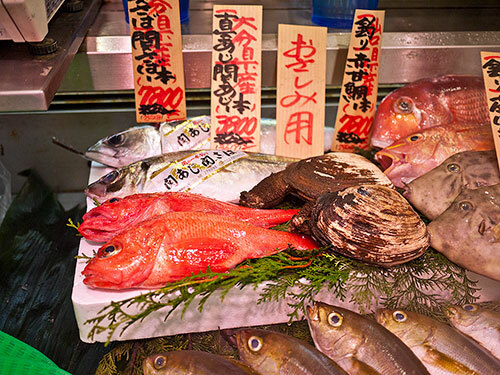 But the truth is, fish is central to washoku or traditional Japanese cooking. It's a bit hard to be a vegetarian in Japan, but being a pescatarian is very easy. While modern Japanese people do eat a lot of meat dishes, up until about 150 years ago eating meat was actively discouraged by the government, so meals were centered on vegetable proteins like tofu, and fish. And in Japan the array of fish available is rather bewildering. So in the spirit of showing you the real fundamentals of traditional Japanese cooking, for Lesson 5 we'll be tackling fish! If you can get a hold of the fish in question please do try following along. If not, I hope the information will be interesting at least. Note that I'm able to get all of these fish in my small village in southern France because we have an excellent fishmonger (poissonnerie) even though we're about a 2 hour drive away from the nearest fishing port. So please take a look around to see if you have a good fish seller in your town. A good fish shop should not smell 'fishy' at all; it should smell like the fresh sea air, and be impeccably clean, with lots of shiny, bright and clear-eyed fish. I've arranged these in order from "probably easy to get for most people" to "maybe be very hard to get". a whole piece of tuna or bonito - a section of the body part, not the whole fish obviously (that would be rather unwieldly). I will show you how to break down a piece of fish to turn into pieces cut for sashimi or sushi. That's right, you don't have to restrict yourself to pre-trimmed, expensive pieces of sashimi-fish from Japanese grocery stores or expensive fishmongers to make sashimi and sushi, as long as you have good fresh fish. I do not expect you to get all the fish by any means, but perhaps you can file the lessons away for later. Since I've revised the lesson plans, I'll be posting the first part early next week. (I'll be posting some non-lesson stuff in the meantime though.) I hope you'll enjoy the fish lessons! Submitted by maki on 2013-04-08 17:08. Great series I hope that they will become a book or at least an e-book of some kind. I have a Kobo Glo ereader but can deal with other formats. If it does not happen you have the time I will make my own ebook out of these wonderful postings.I also hope and pray your health is improving as your drama came close to home as I also am a cancer survivor etc. It would be nice if people could also look up their fish selection for sustainability issues--many fish are dangerously overfished, or caught in ways that cause a lot of harm to other animals or water quality. And there are some species that are very high in PCBs and mercury and so shouldn't be eaten often. Sometimes this means I will substitute a more sustainable choice for a traditional one that has some problems. Sometimes you cannot know where or how your fish was harvested, but it is worth trying to find out. This site is very good regarding sustainable stock - click on the name of the fish and it'll give a rating. I am enjoying the series and look forward to the time when I can start trying out all the methods and recipes. I am presently recovering from back surgery so cannot source the ingredients or spend too much time in the kitchen. I do hope you are recovering from your ordeal. Before his retirement, my husband was MD of the South African branch of a Japanese company - this meant we both were introduced to good Japanese cuisine, which we enjoy. Here one fish that is usually available is Yellowtail but we can also get both salmon and sole which are a lot more expensive. We spend 3 months on the Dordogne/charente border every year and there fresh fish is more readily available but I suspect Bordeaux would be our nearest source of all the other ingredients. I am a newbie to cooking fish. I usually only eat it at a restaurant because I have no idea what to do with it, even though I like to eat it. Also, my husband says he doesn't like fish (that fishy taste/smell). I've heard that "white fish" is better to try if someone doesn't like fish since it doesn't taste or smell fishy... but is it really white? Whenever I look through the fish for sale at the store, none of it looks white. Various shades of pink/red/orange is all I see. I am a foreigner in Japan, so I have plenty of fish available to me, but I don't know how to find/ask for what I want. I love your blog! The pictures and recipes are amazing! keep up the good work! I am loving this no-nonsense-but-no-stress intro to Japanese cooking. I consider myself an intermediate to advanced cook, but Japanese basics cover a lot if different ground than Western basics, so these lessons are great in helping me take dishes from "Japanese inspired" to more authentic. I live in the US but my area has a very high Vietnamese and Cantonese immigrant population, and over the last few months I've had a lot of fun working a lot more with untranslatable spices, veg, "off" (to an American perspective) cuts of meat and whole fish at a local ethnic grocery. The best thing about small family markets, too, is that I've been able to work out a decent "Vietlish"-slash-interpretive-dance with the staff there who are tickled in my interest in their cuisine! In a strange way, working with foreign ingredients and "strange" recipes makes me feel much more confident-- if my lasagna doesn't come out the same as my mother's, I feel like I've done it wrong even if it's good; but I'd never had Japanese simmered mackerel before, so when mine tasted great, success! Thank you very much for these lessons; I hope many people try them out and have the joy of surprising themselves with great new dishes!